Atlanta's historic downtown street grid is all that is left of antebellum Atlanta. Persistent efforts by the Atlanta City Council to rename streets threaten to erode this historic evidence despite neighborhood opposition. Disregarding a 2003 ordinance intending to make street renaming more restrictive, the Council is known to have often waived the laws' requirements. 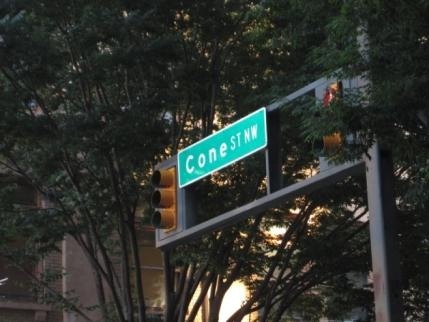 The proposal to rename Cone Street was altered to include memorial street sign toppers rather than renaming. However, the proposal to rename Harris Street was passed by City Council on May 16, 2011.